Buford Betty: Two patients with little patience. Aw, poor Charlie! I hope he feels better soon... and you too! 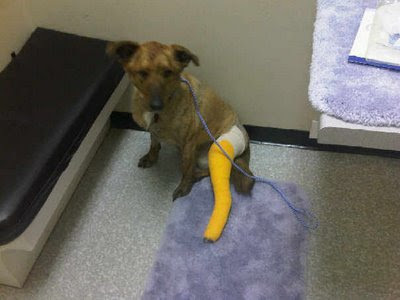 Charlie- you are still as cute as can be in your bright yellow cast!! I'm sending you lots of puppy kisses and cuddles!! Oh my goodness, Charlie is just precious! (I'm sure he does not take this as a compliment, but he looks so sweet in that picture) I hope he get better very soon so he can enjoy the warm weather. And I hope you start to feel better too! Aw he looks so adorable, but I still feel so bad. I hope he is okay! Bless his heart! I hope you both feel better soon! Your poor puppy! I hope he makes a fast recovery. I'm so glad it went well! Oh, poor guy! The pathetic stare coupled with yellow booty breaks my heart. Hopefully a speedy recovery (for you both) is in store!